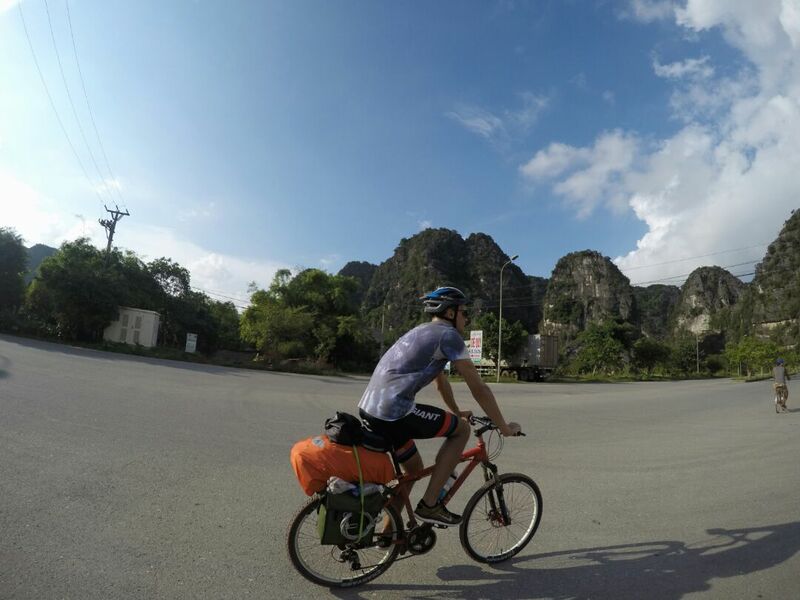 We chose Tam Coc as our first destination off the back of a conversation we'd had with a fellow Brit, and expat, on our Halong Cruise. 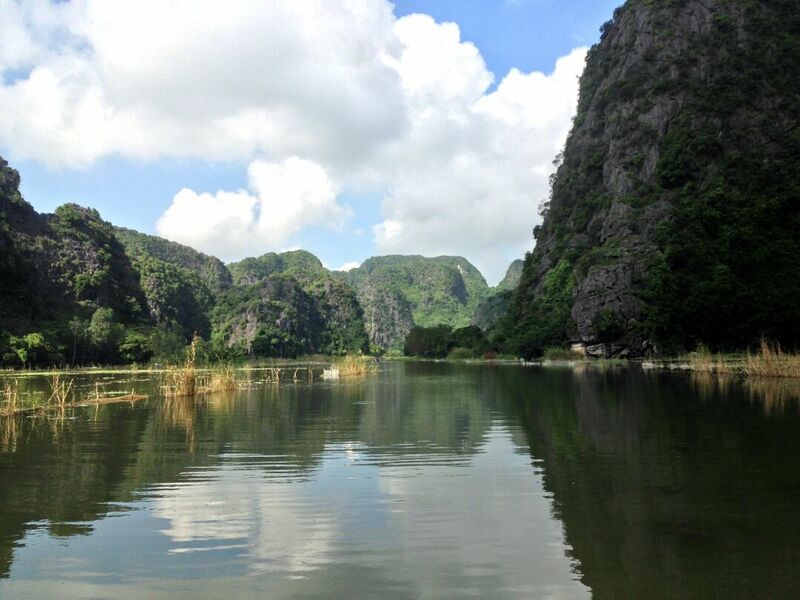 He had said it was the land version of Halong Bay, very beautiful and quick and easy to get to by moped from Hanoi. So we thought it worth a visit. 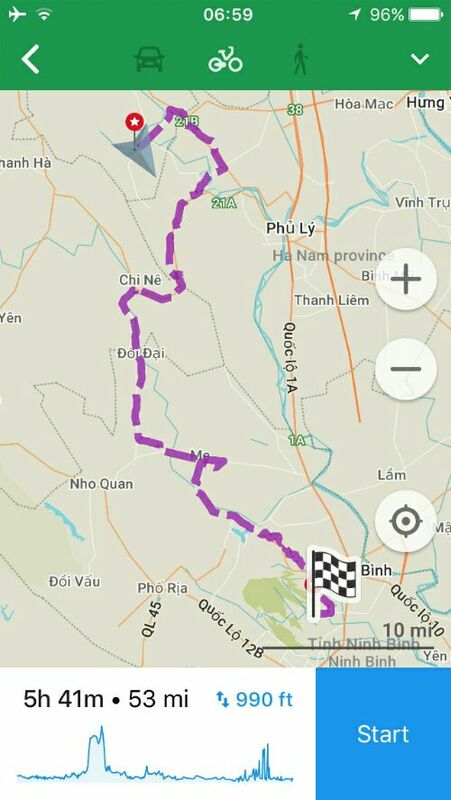 After looking at the map we figured it would take two days of cycling to get to Tam Coc, which is situated just West of Ninh Binh. A perfect little stint for our maiden voyage. 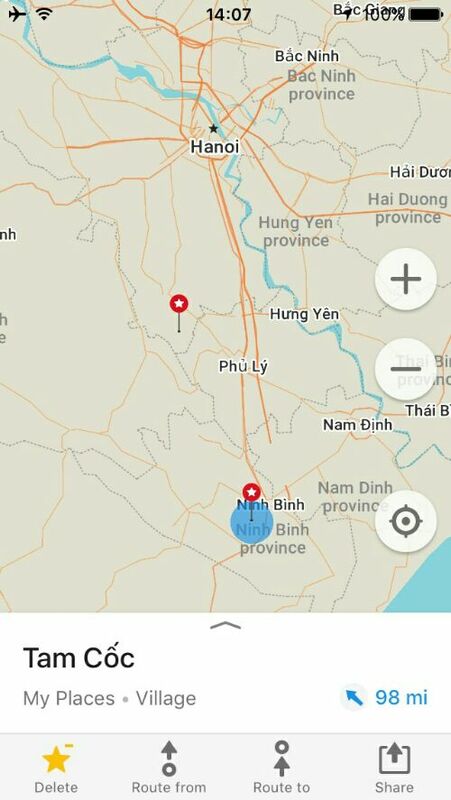 The stop halfway was in Huong Son - the only place that showed up with a 'Nha Nghi' (Guesthouse) on Maps.me - an app that enables you to find POI's and plot routes completely offline. 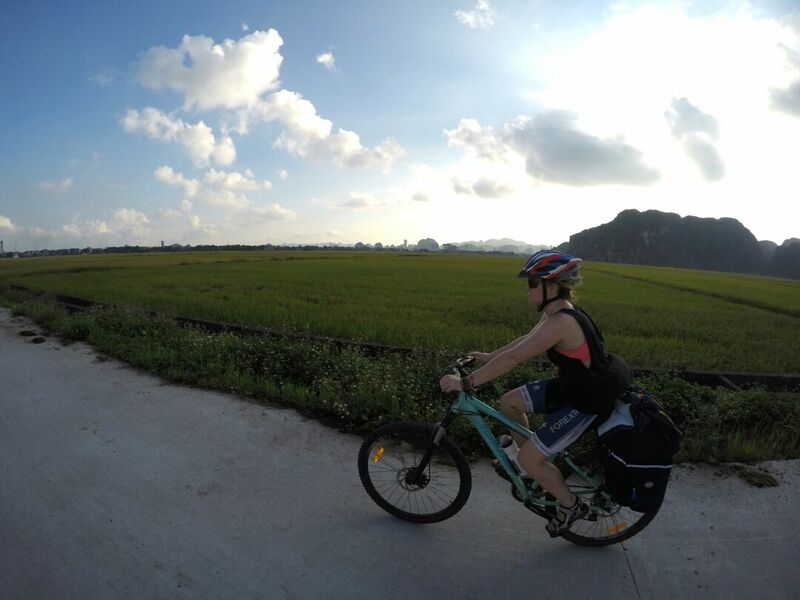 The ride out of Hanoi was, as expected, pretty horrible. The traffic was bad, the bikes were heavy and you could feel the pollution in the air with every breath you took. 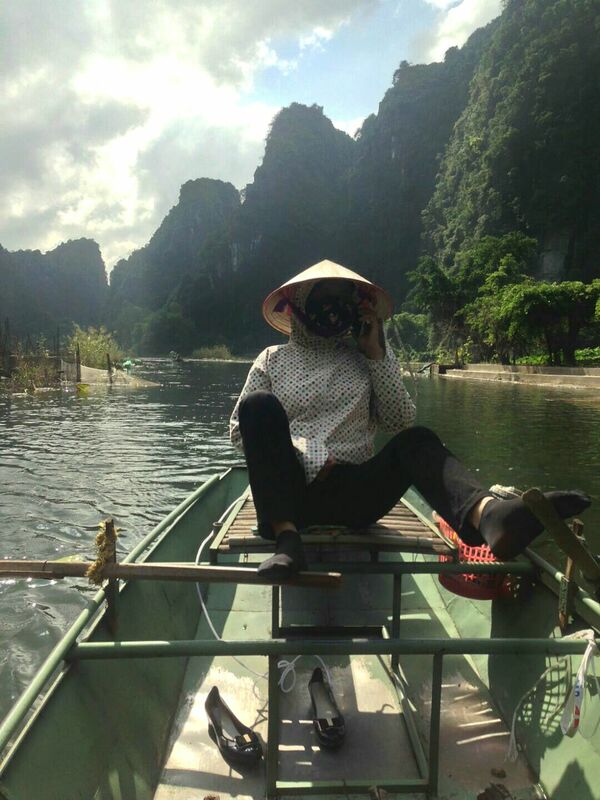 We should have worn face masks like the locals!! As we were cycling along we noticed how friendly everyone was, almost every single person waved or shouted 'hello'. It was all very exciting, we felt like celebrities. The school children went mad for us! Cycling and mopeding along next to us - giggling profusely if we responded with a 'hello' back. About 20 miles before we hit our first overnight spot, the heavens opened! 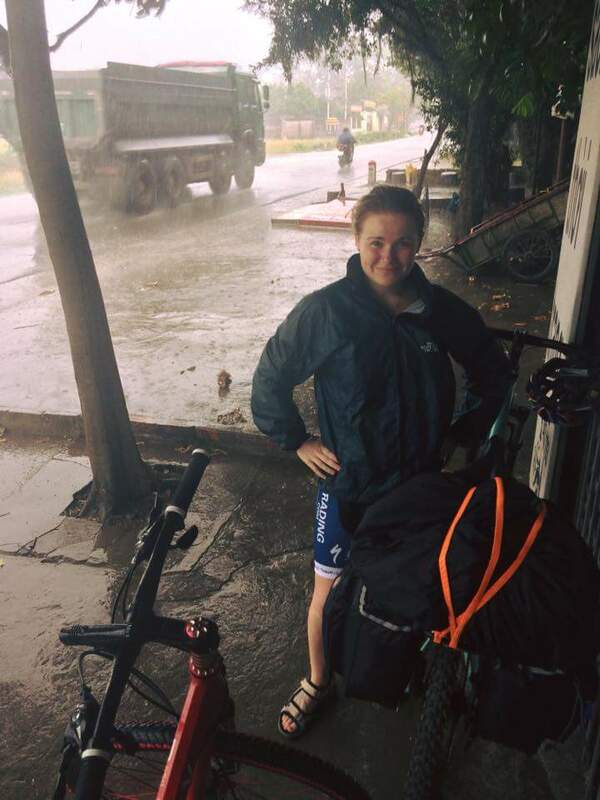 We sheltered for a while but decided we must soldier on to get to Huong Son; the ride had already taken longer than expected due to a late start, heavy traffic and having to stop to map-check numerous times. 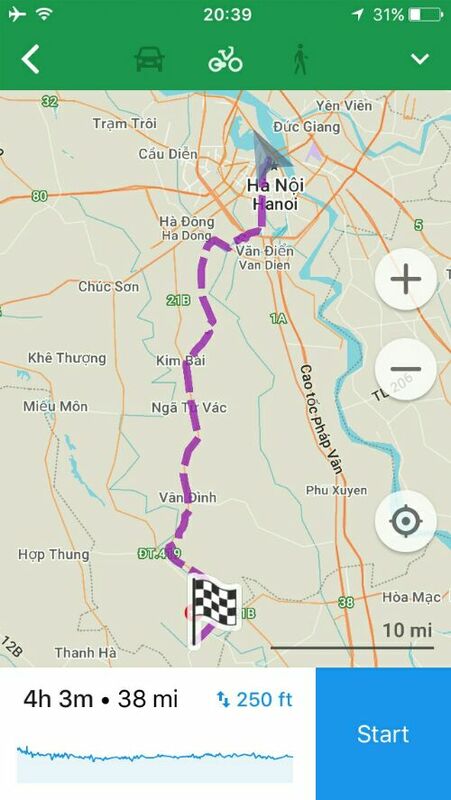 Why are there no road signs in Vietnam!? 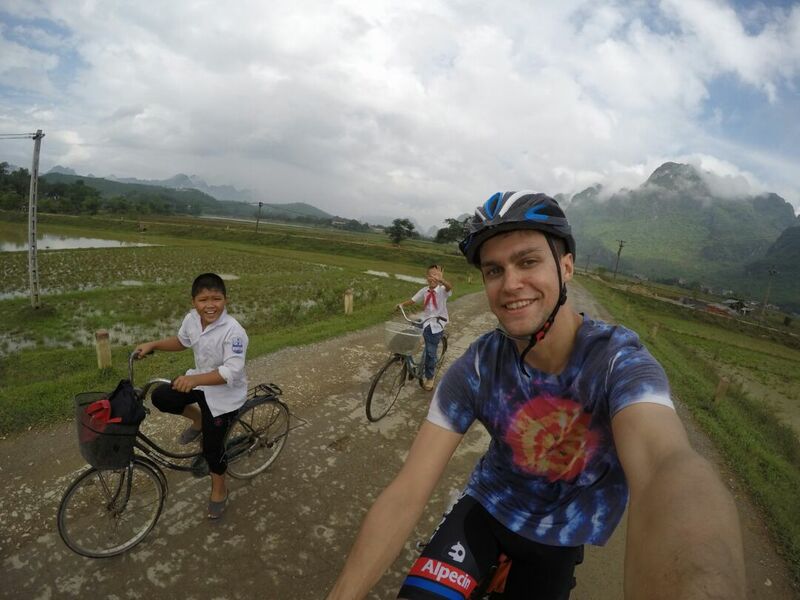 We rode into Huong Son looking like two drowned rats, people were still cheerfully shouting 'hello' and waving (and laughing a bit) but the novelty was starting to wear off. We had booked a no obligation place on booking.com which was where we were heading, but there was a plethora of guesthouses and we got offered a much better deal on our ride through the village. 200,000 Dong (£7.36) for a place to sleep with AC and wifi - it was a steal. The kind lady of the house cooked us a delicious dinner and breakfast and we set off again the next morn for Tam Coc. Again, we got rained on - but at least we knew double bagging all our clothes kept our belongings dry. After a while it dried up and it was quite a beautiful ride into the national park. As it had been so easy getting accommodation the previous night, we decided not to book ahead this time and just rock up like proper nomads - and that is what we have been doing ever since. So far, so good. 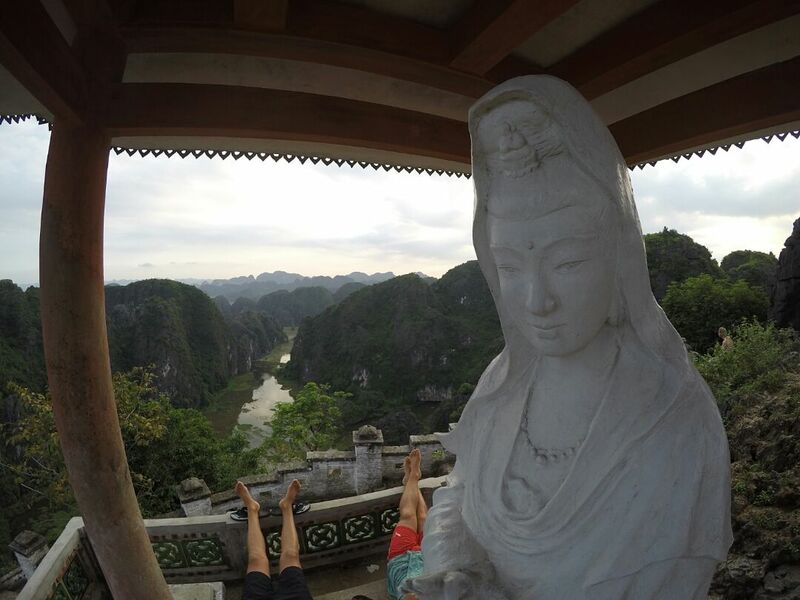 Tam Coc itself is beautiful but there isn't a whole lot there - you could probably do it in half a day. 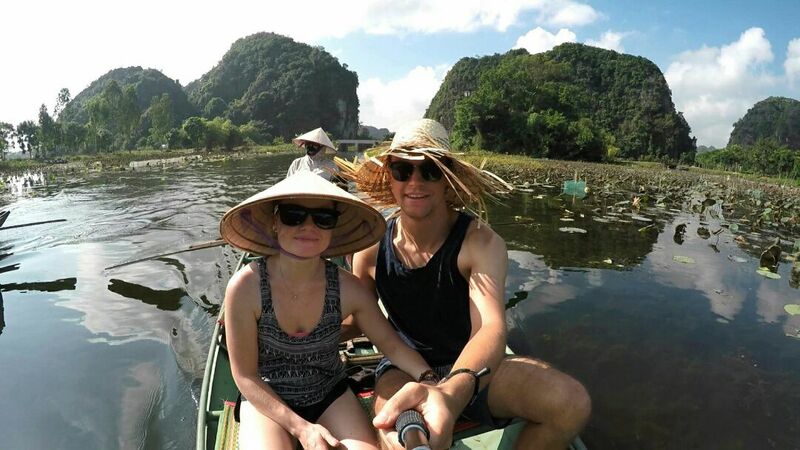 We went on the peaceful 2 hour boat ride up through the rice paddies which had just been harvested. 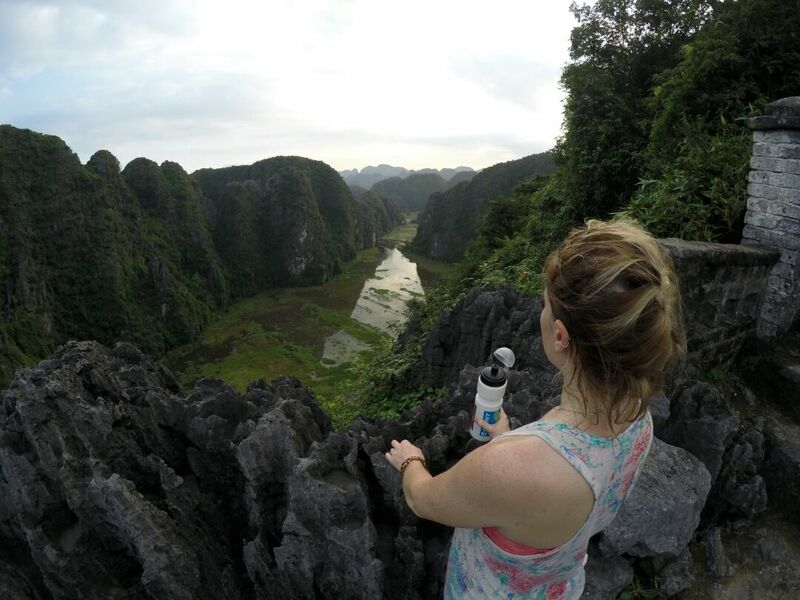 And we peddled to the Mua Caves and hiked up the 500+ giant steps to the impressive 360 viewpoint looking out over Tam Coc. 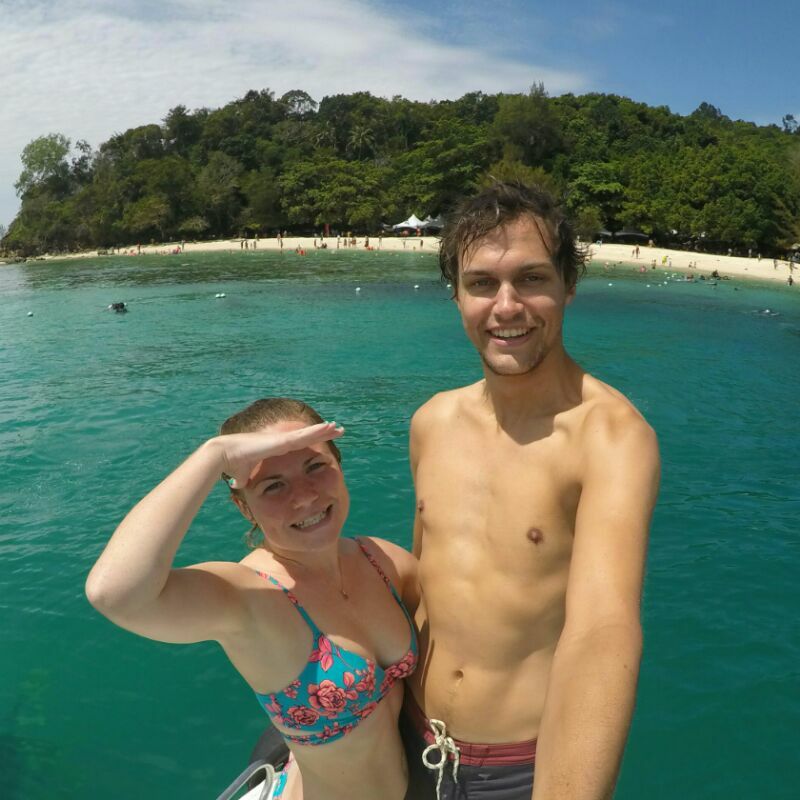 Over the past few days it had been very hot, very humid and we had been incredibly active. I was starting to feel physically weak - perhaps from the lack of salts? The Vietnamese don't keep salt on the table like we do in the UK so I needed to find another way of replenishing my salt levels. Shots of Soy sauce!! Very high in salt, this is my new Chinese style remedy of re-salting myself after a hard day of sweating profusely.